The Ghylls and Becks of the Lake District - commonly referred to as Gorges - add so much more to the scenery. Always changing, sometimes roaring in the anger of full flow after heavy rain, other times gently trickling and full of calm, but forever a delight to the eye. Some Ghylls are full of slippery rock and best avoided. Those mentioned here offer plenty of grippy rock and good ones to go for. However, care should always be taken! Although this activity can be done year round, it is best enjoyed during the warmer months, we suggest April - October as parameters. the water may not be warm, but surprisingly it often isn't cold either, yes honestly. Go prepared and this is one of the most fun and outstanding activities there is in the Lake District. By going prepared we mean: wear a wetsuit (shorties are good as they don't restrict movement); have a towel & complete change of clothing back at the car, after all you'll be getting completely soaked; take dry bags for car keys / phone / etc. Glen ridding beck, Ullswater - the lower section is open and pleasant with easy access. Beware, some of the bedrock is slippery Slate. The most suitable of these gorges for a family visit would be Stickle Ghyll in Langdale. This depends on which gorges most interest you. But a good central base would be the Ambleside / Coniston areas. These provide convenient access to most of the Lakeland valleys. These are a few suggestions to get you started, the exact kit list will depend on the gorge, conditions on the day, and personal objectives. Want to get the see the best gorges and not worry about the logistics and technical aspects? 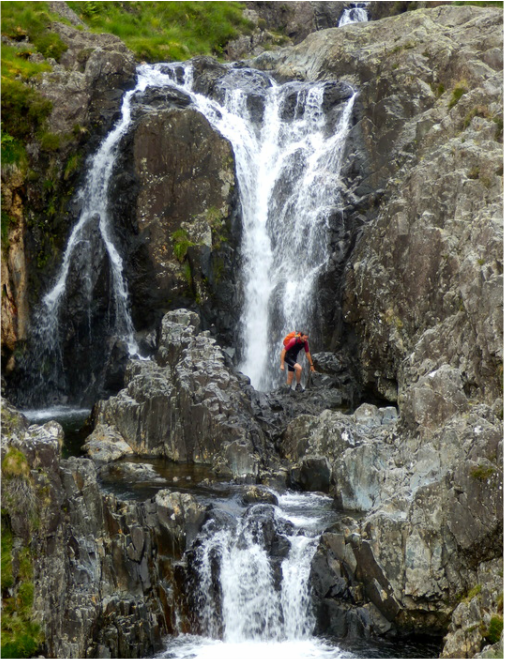 We can arrange for a day of guided Gorge Scrambling or Canyoning in any of the above mentioned venues and many more. We provide all safety & technical kit too.